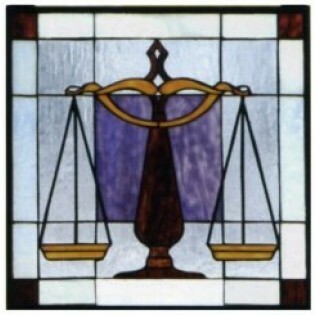 Balance the scales with this Law window. Burgundy, Gold and Royal Purple stained art glass, on a Crystalline background, will delight your lawyer, law firm, judge, or legal professional. Framed in solid brass, this Legal Stained Glass Window has brass mounting bracket and chains included. Created with 78 pieces of hand cut glass it is the perfect prescription. Attorneys and members of the court, bring us justice.